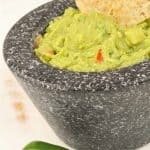 This easy recipe for homemade guacamole is made with ripe avocados, plum tomatoes, jalapeños, cilantro and fresh-squeezed lime juice and only takes about 10 minutes to make. Halve the avocados lengthwise, remove the pits, scoop the flesh into a mixing bowl and mash to desired consistency. Add the lime juice, garlic, onion, jalapeño, tomato and cilantro and combine well. Season lightly with salt and freshly ground black pepper, then cover and allow to stand for about 5 minutes. Taste and adjust the seasoning, then stir in the hot sauce to taste. For maximum flavor, cover tightly and let stand at room temperature for about 20 minutes before serving. Serve with store-bought or homemade baked tortilla chips (see below). When shopping, select plump avocados with the button of the stem still in place. Ripe avocados will yield to slight pressure. Avoid fruit with blemishes and dark spots. To ripen avocados, place them in a brown paper bag and store at room temperature for two to five days. To accelerate the process, add a banana or apple to the bag. For more tips on cooking with avocados, check out our Avocado Primer.